Daily activity reports are a critical part of every security operation. For contract security teams, the daily activity report is often the forefront of client communication. Successful companies understand the importance of a well written Daily Activity Report (DAR for short) and train their teams accordingly. In this article we'll cover the four basic elements every DAR should include. Then we'll finish by exploring three bonus elements that the industry's best are making an effort to incorporate on their reports. Ok.. let's start with the basics. Basic Daily Activity Reports should include the officers time on/off site, shift change information (if applicable), a record of all activity throughout the shift including routine patrols, and any unusual activity. These are items that must be in every daily activity report. Even if they’re not required by the client. Part of being a professional in the security industry is maintaining a high standard of service, whether it’s required by the client or not. No.. not the time the shift was supposed to start. The time the shift actually started. And the same goes for the end of the shift. Allowing the officer to round off start and end times is starting off on the wrong foot. Use time keeping or guard management software to accurately log the time on and off site. Most solutions can even geofence the property to prevent the officer from clocking-in unless they’re on the property. If there are pass down orders relevant to the property and/or the client, your officers should document that exchange of information in the DAR. Now, not every post will have a shift change. But most posts will have duties that apply specifically to the beginning of a shift. If that's the case, note it in the report. This lets your client know that the officer is on site, ready, and prepared to work. 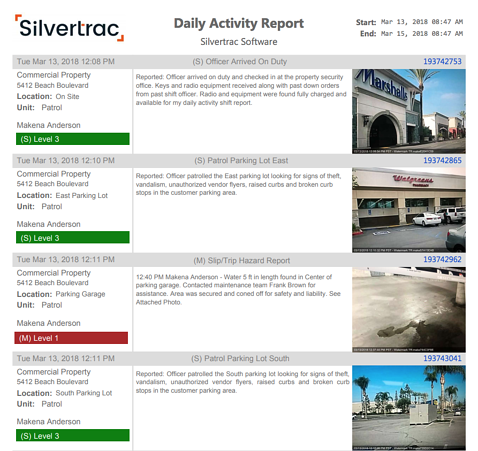 Daily activity reports should document everything the security team does to increase presence on the property and prevent unwanted activity from happening. Remember, the DAR is the summary of the work completed for the client on a daily basis. If you fail to include detail in your report, what does that leave the customer thinking about your services? 0500- S/O Lawson on duty at this time. Received all pass-downs. 0600- Begin patrol of Building 1. 0630- End patrol of Building 1, no unusual activity. 0800- Begin patrol of Building 2. 0845- End patrol of Building 2, no unusual activity. Security should be the eyes and ears for the client. You wouldn't want your customers finding out about an unusual occurrence from someone else on the property. To avoid that, officers should report anything happening on site out of the norm. At the very least, this proves that the officer is alert and paying attention. Most daily activity reports will accomplish some version of the 4 basics shared so far.. But let’s talk about 3 ways you can take your DARs to the next level, giving your customer something to talk about, and driving home the value of your services. 95% of the time, your clients would love to spend their security budget on something else. It's your job to find ways to deliver real value to the property and include that value in your DARs. “Officer made positive contact with the Starbucks Store manager to see if there were any current issues at the property. Mr. Petterson didn’t have any issues but appreciated us checking in”. When your client reads the Daily Activity Report they should be reaffirmed in their decision to work with your team. Train your officers to find simple ways to deliver and document value for your clients. Bonus Tip: A picture is worth 1,000 words.. If you’re daily activity report can include pictures of the property as your officer is on patrol, the customer will see and feel more value than when they receive a simple written report. Request a demo and we’ll show you how every officer can create valuable Daily Activity Reports (without spending their whole shift writing paper reports). Security is on site to reduce the risk and liability of the client. The DAR needs to include language that helps reduce their risk and liability. Creating detailed notes explaining what issues the officer is looking for while on site creates a report that has less grey area in the case of a lawsuit. Officer patrolled the east stairwell looking for any safety hazards. Officer checked the lighting, signage and handrails to ensure they were in normal working condition. Officer checked all storage containers to make sure they were locked and secured with no signs of forced entry or damage. Officer patrolled the pool area to ensure that all community rules were being followed. Officer checked for unattended minors, glass bottles, and improper use of the facility. This is the most nuanced element of a DAR because it will vary from site to site. Ultimately your Daily Activity Report should reiterate your commitment to the client and their goals as an organization, whatever that may be. Make sure that high priority items or areas of interest are mentioned in every DAR to show they are getting the necessary attention from the officers on site. Include entries from your supervisors that detail what is covered in site specific training. Use a paperless guard management solution to automate post order reminders that train the officers and note trainings in the DARs. Now I admit, this is a lot to ask the average officer. But believe it or not, we've got hundreds of security companies using Silvertrac to deliver value-packed DARs to their clients every day. Our software makes it simple and seamless for even the least tech-savvy officers out there. Schedule a demo with our team and we'll show you how to reduce the amount of time it takes your officers to generate transparent, contract winning Daily Activity Reports.